Indianapolis Intl. - Macdonald-Cartier Intl. Pearson Intl. - Macdonald-Cartier Intl. Norman Y. Mineta San Jose Intl. - Macdonald-Cartier Intl. Since it was founded in 1826, Ottawa has evolved until what is now one of Canada's most important cities. Originally developed as a settlement for French and Irish immigrants, the city now boasts a diverse population, several points of interest, and a friendly attitude toward visitors. 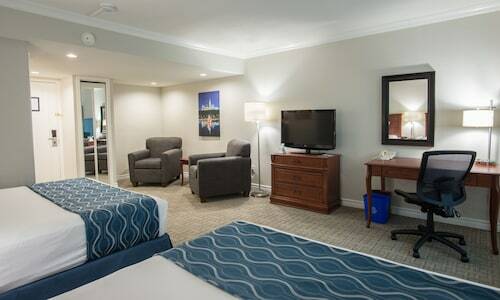 You won't have to worry about being bored here when you take advantage of Ottawa package deals on Travelocity. No matter what your vacation budget is, you'll have a grand time taking in all Ottawa has to offer. There's no shortage of sites and attractions. Start with a visit to Parliament Hill where you'll learn a great deal about the history of the city and get some fantastic photos of magnificent buildings, followed by a stroll along the Ottawa River, stopping for a picnic on the scenic shores. After that, head to the National Gallery of Canada and soak in the beauty of various art exhibits. You can also enjoy diverse shopping at Byward Square, followed by an excursion to Gatineau Park. No matter the time of the year you find yourself enjoying Ottawa all-inclusive vacations, its likely there will be a festival in the city -- there's always a guaranteed good time in this city. During the springtime, Ottawa is home to Canada's Tulip Festival; in addition to millions of blooms, you'll enjoy learning more about the history of the tulip. Afterward, you can dine on great food, and take in an array of live entertainment shows. In the winter, take in Ottawa's Winterlude, which features enormous snow slides, live entertainment, and breathtaking ice sculptures for the entire family to enjoy. You can save up to $537 when you book a hotel and flight at the same time through Travelocity. On Travelocity, you'll find all you need to know about Ottawa vacation packages, affordable flight packages, car rentals, and vacation bundles. Travelocity will make your time in this amazing Canadian city as enjoyable as possible, regardless of whether it's in the spring, summer, or during the holidays. 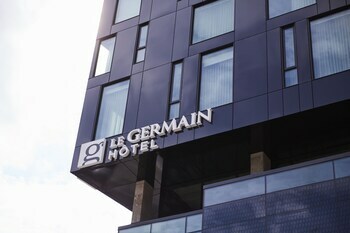 Rising above the Rideau Canal, this French Renaissance-style hotel is regally situated next door to Parliament, across the street from the ByWard Market, and within walking distance of many museums. 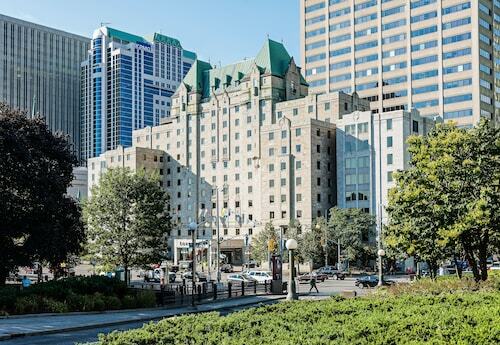 Situated amid Elgin Street's restaurants and nightlife and 1 block from Rideau Canal, the landmark Lord Elgin Hotel is within 4 blocks of Parliament House and the Ottawa Shaw Centre. 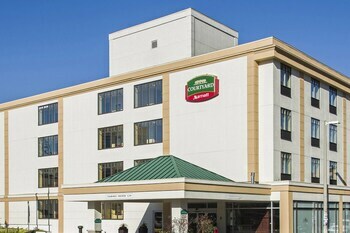 Located in Ottawa Division, this eco-friendly hotel is 1 mi (1.5 km) from Ottawa Hospital Civic Campus and 2.8 mi (4.5 km) from Carleton University. Canada Agriculture and Food Museum and Commissioners Park are also within 2 mi (3 km). Located in Downtown Ottawa, this eco-friendly hotel is within 1 mi (2 km) of Parliament Hill, Canadian War Museum, and Byward Market Square. National Gallery of Canada and Canadian Museum of History are also within 1 mi (2 km). Bayview Station is 23 minutes by foot. 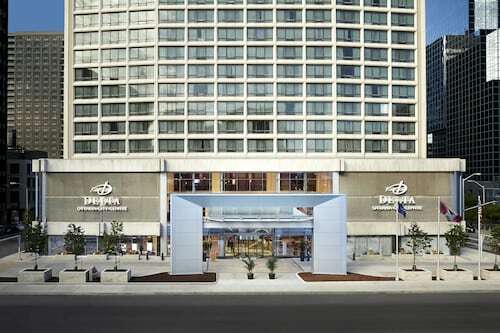 Located in Downtown Ottawa, this hotel is within a 10-minute walk of Byward Market Square and Shaw Centre. National Gallery of Canada and Rideau Centre are also within 15 minutes. 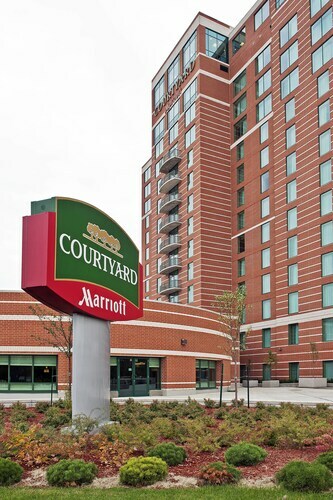 Across from Rideau Canal, Rideau Shopping Center, and the Ottawa Convention Center, this hotel is 2 blocks from Byward Market with its many shops, restaurants, and nightspots, and within walking distance of museums. 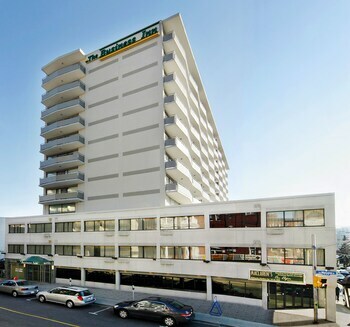 Located in Ottawa Division, this hotel is 1.1 mi (1.8 km) from Strathcona Park and within 3 mi (5 km) of University of Ottawa and Byward Market Square. Rideau Canal and Parliament Hill are also within 3 mi (5 km). Ottawa Station is 10 minutes by foot.